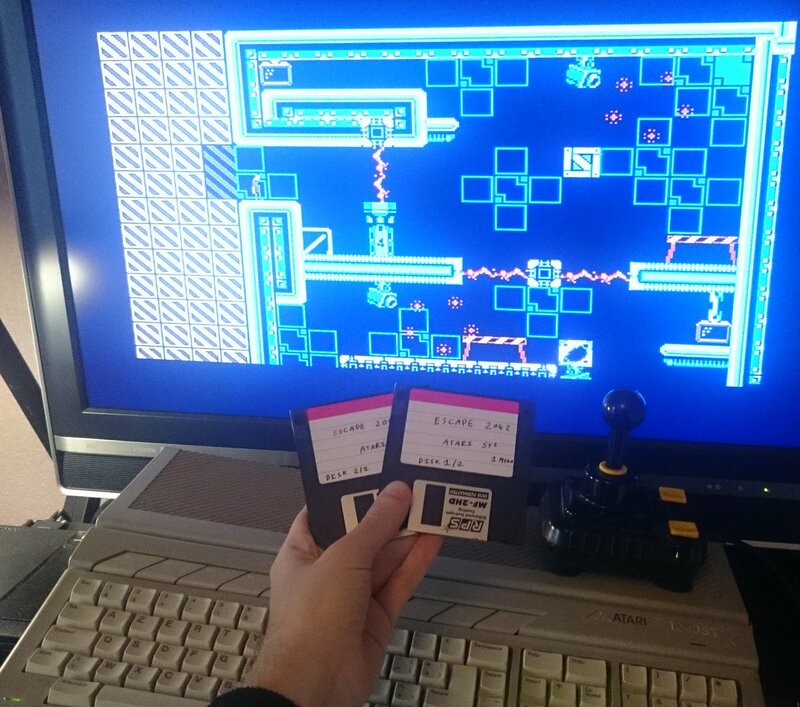 This is a port of my game Escape 2042 to the Atari STe / Falcon, 1 Mbyte of RAM required. 2 floppy disk (hdd version available too) uses the Joystick and runs at 50 fps ! Discover a futuristic fast-paced 2D platformer game, including a reversed shoot'em up mini-game. The game takes place in three different environments (prison, desert, forest) and is interspersed with one mini-game and multiples cutscenes. Avoid the security cameras, collect grenades to get rid of your enemies, exercise your working memory by hacking the computers of the prison to unlock the doors or to dis-activate the safety systems. Last edited by Orion_ on Sat Jan 19, 2019 8:11 am, edited 7 times in total. This is so cool! You actually converted it to the STe. May I ask how you made it? Is it based on a game engine line unity or something else? And there will be a physical release as well for the Atari version?? This game looks very fun! Count on me to buy the boxed version. Glad to see some action packed game for the STe! ST Graveyard wrote: You actually converted it to the STe. May I ask how you made it? The core Gameplay is the same C code for all the versions, but for the Atari STe specific part, I have about 2000 lines of optimized assembler code with STe hardware scroll and Blitter to make it run at 50 fps. 2 months of work to port it. I'm still testing the game from start to end, and debugging some part, but the game is fully ported. Wow, I wish I was able to code like you! Please keep a physical copy for me aside! Where do I place my order? How do you make the game 'playable from hardware' on the Sega Megadrive? Also Orion, I see the game is available on Steam, can you tell me a bit more how you get your game on such a service? Does it have to have a certain levelnof quality to be approved for such a service? ST Graveyard wrote: How do you make the game 'playable from hardware' on the Sega Megadrive? ST Graveyard wrote: Also Orion, I see the game is available on Steam, can you tell me a bit more how you get your game on such a service? Does it have to have a certain levelnof quality to be approved for such a service? First, there was Greenlight, which needed the players to vote for the game, and if it had enough votes, then you could publish it. Oh so the game is already out? And a physical release on Megadrive, how cool. Sorry I did not know that. This all looks very promissing! Nice one, looks really polished! It looks really cool. Nice work. Great work! Always fun to see new games for the Atari ST/Falcon! Orion ! Great work !! I write on my behalf like my friend Piter. We plan in the newest Polish printed magazine "Atari Fan", make a preview of this game. Looks interesting. Will there be a combo release? Buy both Atari and STEAM version? simonsunnyboy wrote: Looks interesting. Will there be a combo release? Buy both Atari and STEAM version? Ah that's great, congratulation on this project! Wow this looks incredible. Count me in for a physical copy also!! A boxed version of the game including 2 real DD floppies + manual + making of, will be available in the coming months at the approximate price of 40€ + shipping.